GOOD MORNING my creative friends! Today is my FAVORITE sneaky peek! Well, I have to say that this ENTIRE release is my ABSOLUTE FAVORITE to this day! 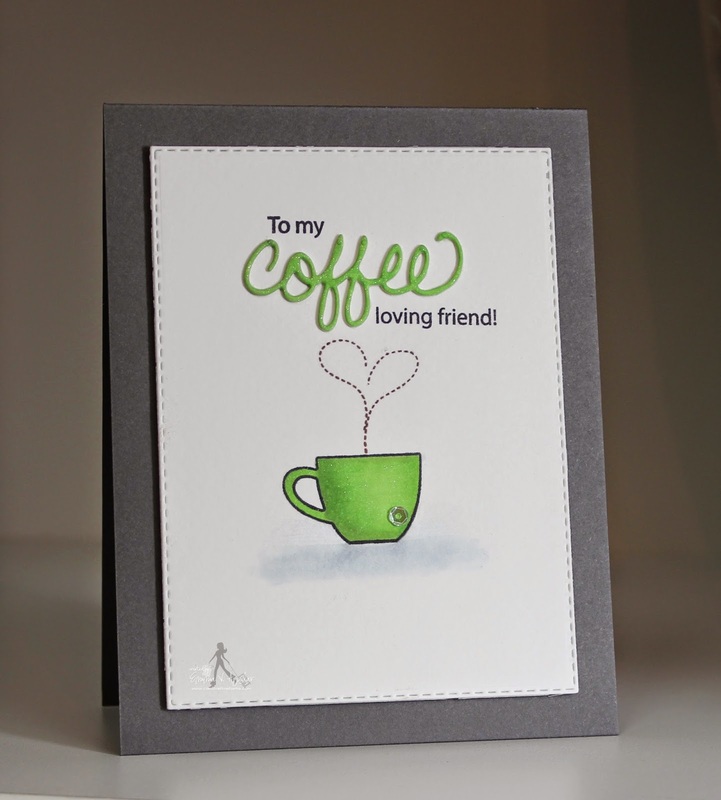 My awesome team & myself are showcasing a new stamp/die set called "All You Need is Coffee". As you ALLLL KNOW, I LOVEY my coffee & I was SUPER DUPER EXCITED about this one! I believe National Coffee Day is on Monday, 9/29/2014 so I thought this was the PERFECT time to release this set! It consists of dies w/coordinating stamps! Here is my first card! You can see the dies in my video below! My favorite die in this set is the stitched steam coming out of the cup! 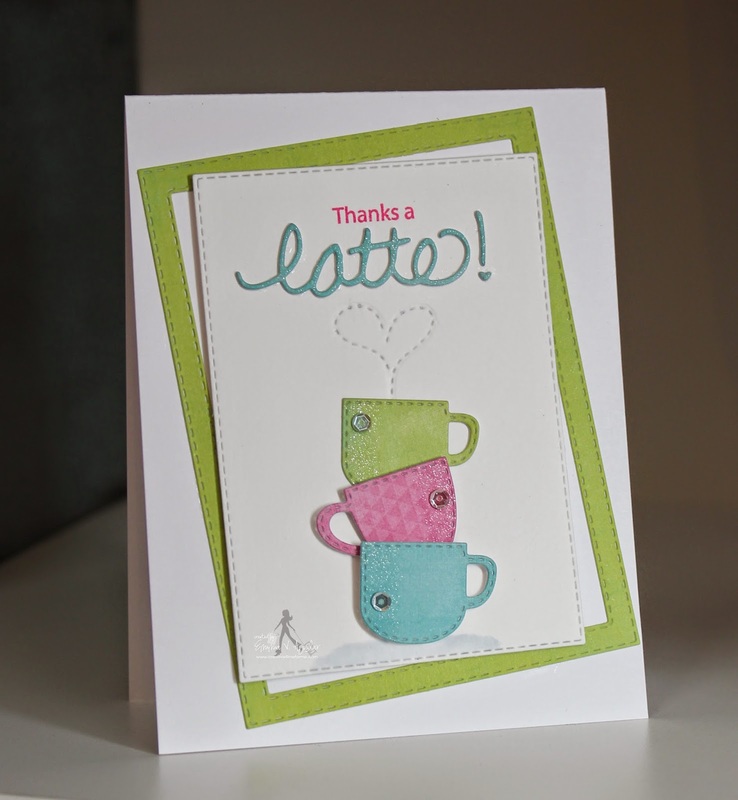 For my 2nd card here, I used the stamp version of the coffee cups along w/the little steam! ;) In this set, you have the options of a stamp cup that is an outline, a solid stamp AND a die! I was super happy to use 2 of my copic markers to color in my cup! I am taking the online Copic Class & I am happy that I did because I don't have many copic markers BUT I am learning to use what I have! The BEST part is that I am also incorporating using my stampin up blendabilities too! Okay, for my last card, I made it a window card using the Stitched Rectangular frames w/the label dies we sneaked on Monday! Here is what it looks like opened up! Okay, now onto our LUCKY winner from yesterday's sneaky peek! Such nice cards! I really like the colors in the first card. The wood grain background and the leaves look fantastic. Those leaf dies are great. Thank you ALL for stopping by! I hope you all enjoyed EVERY sneaky peek this week! Tomorrow is the BIG DAY! YEP, you will be able to purchase your favorites at 8am PST! AND our blog hop will start at the same time, 8am PST! Sale & Blog hop will start tomorrow morning, Sept 26, 2014 at 8am PST! Don't forget to use the code SEPT2014 at check out to get 20% off your entire order! Sale applies to "IN-STOCK" items only! I just love this set. I cannot hardly wait to order it. Great job again Miss Emma! So excited for your release! Love this time of year! Thanks to you and your DT for a wonderful week full of lots of inspiration! Ahhhh, These are MUST HAVES for us coffee LOVERS!! Loving this release, totally awesome!! OMG and YUMMMMMM Girl you so have stolen my Coffee Luvin' Heart with today's Sneaky Peek! I am so in love with it.....I am so excited with your genius creations......Your cards are all so fun, adorable and hmmmmmm made 4 me????? (LOL) Oh I so need today's Sneaky Peek!!! You really did an outstanding creative job on your cards WOW so cute and darling.......Great Copic Job too WOW girl you really did one fantab job with your coloring. Well off to give some bloggy Coffee luv and see you back here tomorrow....SO CAN"T WAIT!!!!! Cute cups. I'm a big tea drinker and could definitely use them. What a cute stitched and steamy heart. Cute for the coffee lovers. Gives me ideas. Adorbs! What a cute set and showing! WOW love this set a latte. Get sneak peek week. Eeee! I'm in LOVE! This set is a must have! I am so super excited and wish tomorrow would hurry up and get here so I can place my order :) I LOVE your cards too Emma! They are so flippin' fabulous!! You totally rocked yet another release and continue to blow me away! I totally have a crafty crush on you, lol! Great coffee themed set and love the heart shaped steam. Everything about today's reveal, as well as the previous days, is spectacular! Love x love this coffee set!! Love love love the heart steam. Looks awesome!!! All the projects are adorable. Love the heart steam! Can't wait for tomorrow!! Oh Yes, I LOVE my coffee too! Great release! Such great inspiration from everyone! Emma I Love this coffee set!! Fall is my most favorite season also and I LOVE coffee so when I saw this coffee set and I was super excited! Thank you thank you thank you! And the heart steam to soooo cute!! You did an awesome job on your cards and on your coloring! Can't wait until tomorrow! Thanks again Emma and hope you have a wonderful day! Beautiful cards, one and all! OMGosh, I could literally jump up and down for joy right now! But then I might spill my coffee. I absolutely love this set, it's the cutest ever! AWESOME cards again Emma!! This set is going to a FLYING out of your store!!! AMAZING day 4 projects everyone!!!! OMG I love it. I love anything coffee related and I neeeeed this to add to my collection!! OOOH!! I am loving todays set a whole 'latte'! LOL! Another must have! Everyones projects are amazing! Emma ~ Oh these are seriously AMAZING! I LOVE them all and your color choices are simply STUNNING! I LOVE the green and gray one ~ EEK! Then the window one ~ Seriously FABULOUS creations always and oh I LOVE this set ~ the steam embossed heart is AMAZING!!! Again this team ROCKS!!!! COFFEE! My absolute favorite beverage, I don't think I'll ever have a day that starts with "I think I'll skip my coffee and have tea, lol". This will go great with the coffee take out cup I already have. Both your cards are AWESOME. And your design team...AMAZIMG!!!! I am a coffee lover, I love this set Thanks for all the wonderful ideas, your DT did a great job! Gorgeous Emma...love your designs today...my fav is the stacked cups!!! Your SWEET cards are amazing. What a fun sneaky peekie. Thanks for sharing. Wow Emma, these are great dies and stamps!! I love all your cards, so pretty. Thanks for the tip on how to color the coffee mug. I just love coffee themed anything. One of my favorite gift baskets to make for auctions and such is always coffee related. Thanks for the beautiful samples. So cute! That heart stamp that comes out of the top- too darling! These cards are super adorable!!! I love my coffee & this set would be one of my favorites! Great projects by the DT! What a cute set! I love your projects today and the colors of your cards. Can't wait until tomorrow!! This has to be my favorite so far .... I love it! Wow! I am always looked forward to your products when you have a release but I have never been more excited that this one. The stitched dies are so amazing! I so wish I could buy them all :) Amazing projects! I just love them all! Totally AWESOME release, Miss Emma! I can't wait until tomorrow to place my order and see all the fun projects for the blog hop! Great job, DT! Love this stamp set! I love my coffee. Awesome stamp set and I love the little cup die. Oh My Word!!! I love today's sneaks...what a great job everyone did not just today but all week. I am looking forward to what everyone makes for tomorrow! It always amazes me how you never seem to be at a loss for card ideas or stamp & die releases. Almost time! Beautiful job on your cards. love, love, love the coffee cups!!! 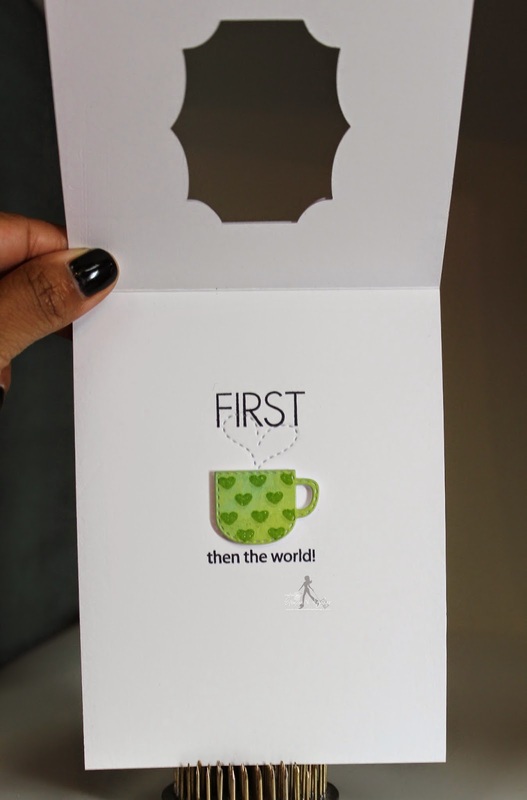 They are adorable and the cards made by you and your design team are outstanding!!! 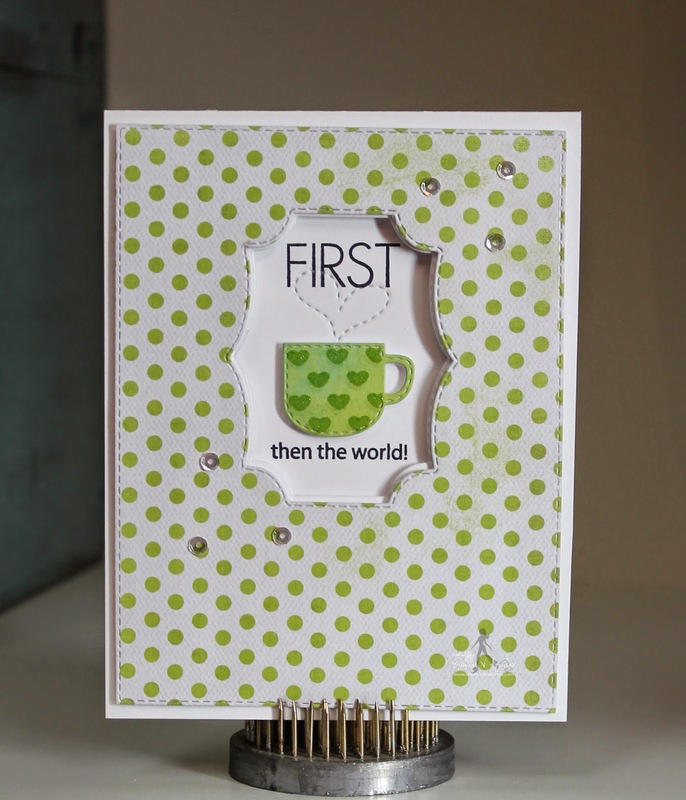 I love how you made the window frame around the cup! Gotta have it! Emma your cards are fabulous! Your coloring is so good!! I love that little window and how you put the wink of stella on just one side of the cups! Hugs my friend! Oh Emma I just love this set! Such great cards and projects from the DT! Love this entire release! All of the cards are adorable!!! I can already tell I would love this set and use it all the time!!!! Your copic coloring is perfect. I look forward to seeing this coffee set tomorrow. These are all soooo Awesome!! Such cute cups!!! Ok looks like I want them all again! This is such a perfect set for gift giving! Love it! This is my favorite of the new release. Love it! Cute, cute, cute! Looks like another one I need, need, need!